Over the many years, I’ve been using meat grinders in the kitchen at home, one of the brands that I keep seeing is Sunmile — their motto is “always reliable, cheaply-manufactured” and for most of their models, I have to agree. They’re affordable and functional, though not flawless. The company has been around for roughly 18 years and is based in China (you can check their website, but it’s not very informative and takes forever to load. They also have a youtube channel, but it’s not the best either :)), which I know can cause some people to worry that they create cheaply manufactured products that break easily. In all the time I’ve used Sunmile products, I’ve never had a problem with breakage, and the overall quality of the models has been impressive. There are some basic things I look for in every meat grinder: Strong blades for cutting up the meat, nice presentation, manageable size (we all know kitchens can be cramped places) and whatever additional features the manufacturer throws in. Sunmile scores well in these categories, although there are some significant differences among their grinders. Thankfully most of Sunmile’s models are compact in size — these things can pack a lot of grinding power for something so small! I think the SM-G50 is one of the biggest of the company’s models and even that one is only about 58 by 32 by 40 inches. Other varieties are smaller, so there’s no need to worry about finding space to store them. Because they’re relatively small in size, Sunmile grinders are also lightweight. That makes it easy to move them around the kitchen, and simple to find places to store them. The SM-G33 and SM-G35 are pretty good examples of the parts you can expect to get with one of Sunmile’s products. Most of the grinders have a detachable aluminum tube and tray. That’s where you place the meet and then attach it to the grinder for processing. Unlike some other company’s grinder parts, the Sunmile tubing is very sturdy and connects well with the base of the unit. There’s no concern about cheap parts that easily break. Most of the models have stainless steel blades, and I’ve found that the units uniformly have the same excellent quality steel. It does a fantastic job grinding up the meat. I rarely find large, unprocessed clumps of meat after using Sunmile models. 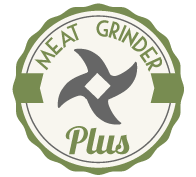 One of my complaints about other types of grinders is you end up having to put the meat through two or three times to really grind up all the meat, but that’s not a problem with these grinders. I also like how easy it is to remove the tray and tube and the blades for cleaning. Once or twice with some grinders, I’ve nicked my finger taking out the parts, and that’s no fun. Thankfully it’s simple and safe to take out the sharp parts of the Sunmile grinders. Cleaning is a breeze with just some dish soap and water and washing by hand. Putting the pieces back into the grinders is just as quick and stress-free as taking them out. There are of course some things about Sunmile products that might turn buyers off, including the fact they’re produced in China. I know some cooks like to have domestic-produced grinders, but I’ve never seen a huge difference between the Sunmile models above (and others from the company) with ones produced in other countries. And some people might not like a different kind of subtle style features. I’m not the biggest fan of the rubber switches that Sunmile uses on some its grinders. They’re also not exactly the most aesthetically impressive things to look it. I know, it’s just a meat grinder, but sometimes you want an appliance that looks first class. Some of the Sunmile models don’t have that look, but this is really just a minimal gripe. The real focus should always be on whether the grinders actually work, and Sunmile’s grinders work well. Besides, there’s enough variety in the types of appearance to keep them interesting. For example, the SM-G73 has sharp, slanted edges for a more contemporary look while the SM-G31 and the SM-G70 have softer, rounded edges for a more homely look. There’s a style to fit every kitchen, and this is really just a case of personal preference. Any of the minor negatives with Sunmile grinders are just that — minor. The positive aspects of this company’s products, particularly the affordable price and the overall quality of the grinding, mean it’s hard to go wrong choosing one of the Sunmile models.